These Chocolate Orange Cookies are a classic Christmas cookie that you will want to make all year long! 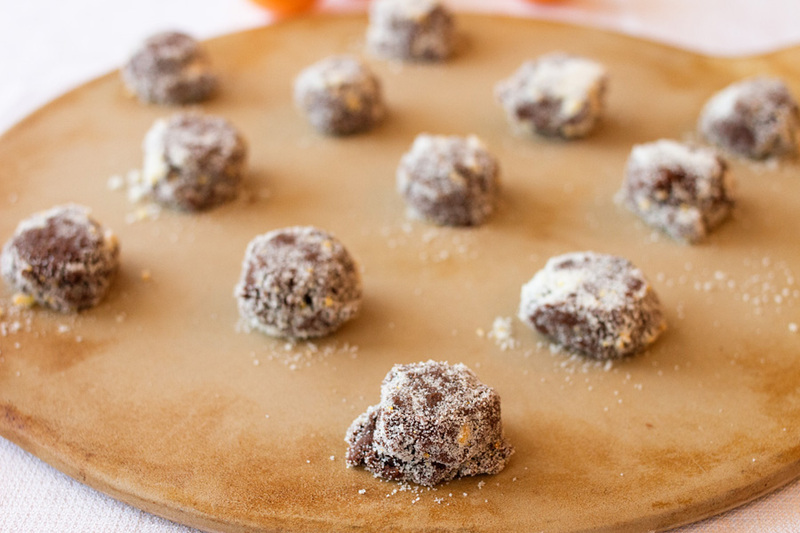 Rich, fudgy cookies with bright orange flavor are rolled in sugar and orange peel for a flavor combination you can’t beat! This year I was able to participate in the Great Food Blogger Cookie Swap. This was organized five years ago by Love & Olive Oil as a way to raise money for Cookies for Kids’ Cancer. Bloggers sign up to participate and pledge a small amount of money (this year it was $4.00) to the Cookies for Kids’ Cancer organization. Then we are paired with three other bloggers to whom we will send a dozen cookies. 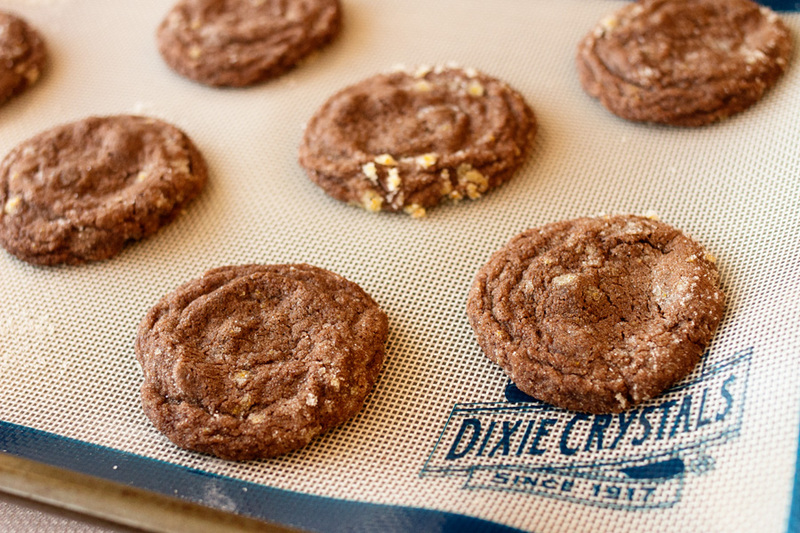 Dixie Crystals sent a non-stick cooking sheet, which makes baking so much easier! Cookies just slide right off, and they hold together right out of the oven better, too, even when they are hot.
. They even have cookie outlines so you can see where to put your cookies! The outlines are placed a little differently than you would commonly see, but they are spaced perfectly so that your cookies don’t bump into one another. 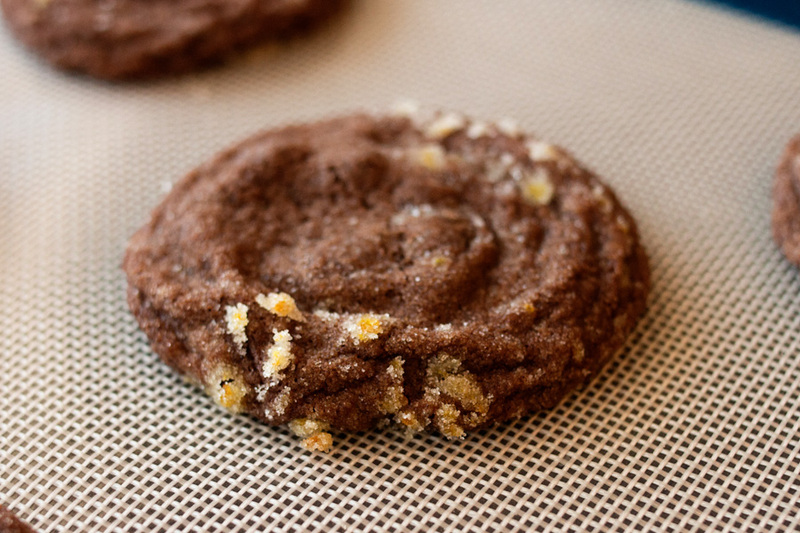 The recipe I chose is one of my favorite Christmas recipes, Chocolate Orange Cookies. I love the flavors of chocolate and orange together as evidenced by my Orange Spice Caramel Corn and Chocolate Orange Ice Cream. They received rave reviews from my father-in-law, who said they tasted just like those chocolate orange sticks his mother used to buy at Christmas time. I also think they taste like those chocolate oranges wrapped in the shiny orange foil. 2. You make the cookies sparkly by rolling the dough in a mixture of more orange peel and sugar. Sometimes when I am feeling lazy, I don’t do this. But they are much prettier when you do! 3. 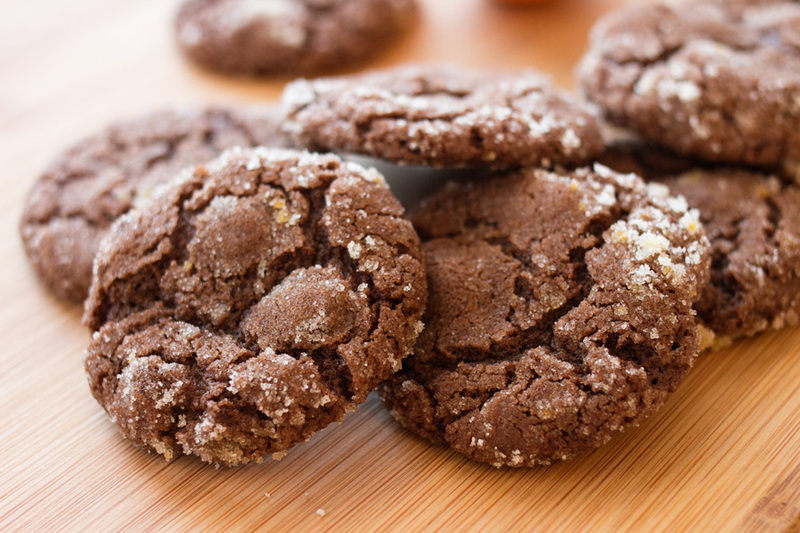 I have found that when I bake these cookies on stoneware, they seem to come out more “crinkly.” They don’t taste any different–they just look different. 4. You can either make small cookies, or large ones. I used a small cookie scoop to make mine (so I could make lots of them!) I suggest that the balls be anywhere from an inch to an inch-and-a-half in diameter. When they come out of the oven, you can see the pretty sugar and orange peel. I gave these cookies to all my neighbors this year. They are such a fun, different Christmas treat! You’re going to love them. I guarantee. 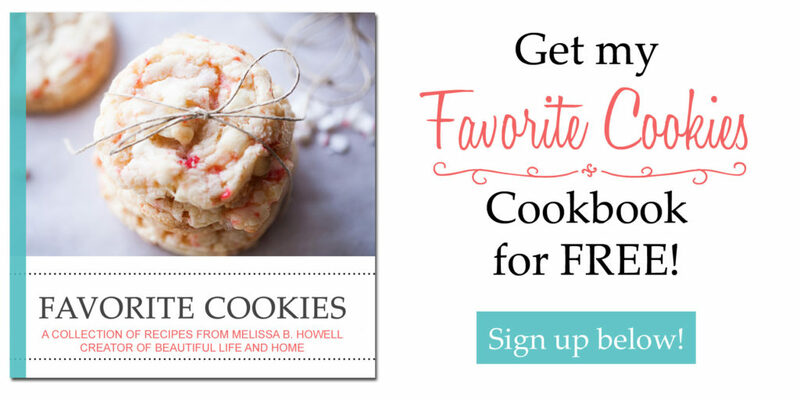 For more amazing Christmas cookies, try my White Chocolate Candy Cane Drop Cookies, Peppermint Chocolate Slice and Bake Cookies, and Cranberry Orange White Chocolate Chip Cookies. 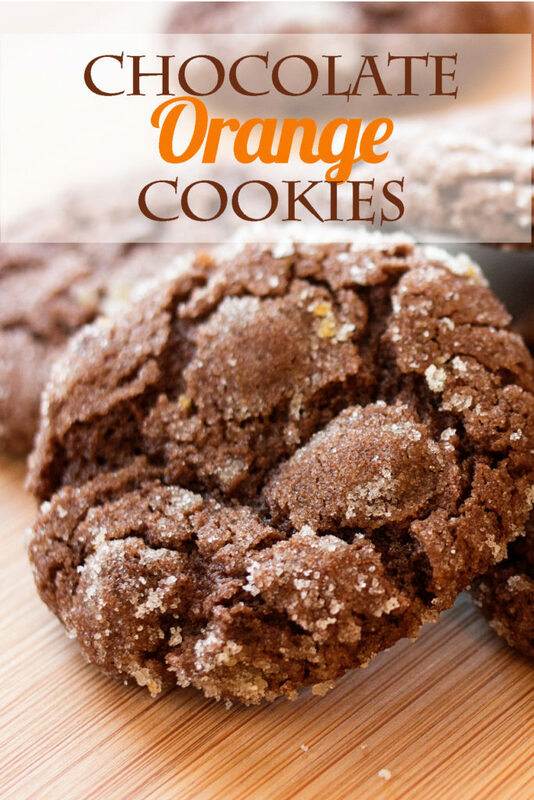 Rich, chocolate cookies are brightened with the flavor of orange in these cookies that are perfect for Christmas or any time of year! 1 teaspoon orange extract, or 3 drops doTERRA Wild Orange essential oil. Mix one cup of sugar with the butter, 1 Tbsp. orange peel, orange extract (or orange essential oil) and egg together. Stir in flour, cocoa powder, salt, baking powder, and baking soda. Stir in chocolate chips and pecans (if using). Roll into 1-1 1/2 inch balls. Bake 9-11 minutes until the edges are just starting to crisp, but the centers are still a little soft. (If using stoneware, add another 2-3 minutes, especially for the first batch). Let cool slightly, then transfer to a wire rack to cool. If you use essential oil rather than orange extract, make sure it is approved for internal use. I like this recipe too. Thanks for giving it to me some time ago. I made some this year but mine don’t look nearly as nice as yours since I just put them on the cookie sheet with a spoon and smashed them with the bottom of a sugar-coated glass. But they still taste great. i dont have Orange essential oil as substitutes what should i use ? If you don’t have an essential oil, just go ahead and use 1 tsp. of orange extract. I should put that in the recipe! My friend made these for my birthday and they’re the BEST cookies I’ve ever had! Thank you thank you thank you!!! Debbie, I’m so glad you liked them!I hope you get to make them many times for yourself! I baked these cookies and they are delicious! Thanks for the recipe! You are welcome! So glad you enjoyed them! How many cookies is this recipe supposed to yield? I don’t see this indicates anywhere. Honestly, I don’t remember! I will need to pay more attention the next time I make them and add that in! If you make them, let me know how many you get. Thanks! Every year I bake Christmas cookies to send to family in Denver. This year I was really looking to get out of the box and send several different flavor profiles. I came across this recipe. I mean how can you not like chocolate and orange? Thanks for the great recipe!! Step 6 is to put sugar and orange Peel on the surface of the dough? Yep! You mix the sugar and orange peel in a bowl and roll the balls of dough in it before you bake. Perfect combination and unique such cookie ,guess what I am trying next ,your cookie! I think you need more soda and flour so they don’t have a dip in the center. If you try it that way next time, let me know how they turn out! These cookies are delicious! I have already made them twice. Usually I make them for my friends but I find myself not wanting to give them away! Thank you Rachel! Yes, they are hard to give away!